Hi all, today is a pretty somber day for me and that is because Miitomo has been officially terminated. Nintendo have shut down the servers to their first Mobile app, mainly due to it “fullfilling” its function as a “water test” for Nintendo to dip their toe into the Mobile Gaming Market. I am not surprised by Nintendo’s decision but it still saddens me all the same. I had invested a lot of hours into Miitomo and it allowed someone like me, who is not artistically minded, to be creative and make weird and wonderful Miifotos. I used the Miifoto feature a lot. I could dress my Mii in all the outfits available that I would later use to create some of our first banners and feature images. I had to use other programs as well to get the finished result but all the Miis in our feature images and even some of our YouTube videos originally came from Miitomo. The app was very basic when it first released and you were limited to what you could do. However, as time went by, Miitomo got extra features like Redecorating your room with wallpapers and flooring, the ability to share outfits and more and more Miitomo Drop minigames that you could play with a chance to win new and exclusive outfits. Thee main premise of Miitomo was to gauge public interest in things and sometimes even market research. These would come in the form of questions that you would be asked everyday. You could even ask and answer your friends questions. This information ultimately helped Nintendo to find potential ideas and research where public interest was currently focused at the time. Very clever Nintendo, Zuckerburg could learn a thing or two from you. My interest in the app was not in consumer interest or politics but the enjoyment of creating silly Miifotos with friends I have never met and live halfway around the world and yet, I could interact with them, message them, take photos with their Miis. When special outfits like the Legend of Zelda or, Metroid costumes came out, I would immediately try to play the Miitomo drop for them, sometimes using actual money to finally acquire them. These outfits allowed my Mii to cosplay as my favourite videogame characters. I would then use them in my feature images on this very website. I was not the only one that used Miitomo and broadened its potential past its fairly limited range. Some people went as far to create their own “Miitubers” and had their own channel on YouTube. NBro was one such MiiTuber. I was fascinated by his unique approach and after talking with him, He interviewed me on his Channel in Mii Form! I later replicated his formula to create my own “Miitendo Direct” talking about the Nintendo Labo when it was announced. The Miis get a poor rap. They were first introduced in the beginning of the Wii era with the launch of Wii Sports. They were our avatars in the game that made us feel more connected with the game we played. The Miis went on to have a string of games including but not all; Wii Sports Resort, Wii Music, Nintendo Land, Tamadotchi Life and Miitopia. A number of other Nintendo titles like Mario Kart 8 and Super Smash Bros Wii U & 3DS also includes Miis as playable characters. The fact that Miis allowed us to represent ourselves in Videogames appealed to me very much so. I could literally be the hero in my own game. My victories felt more personal and the defeats were just as meaningful. As untalented as I am, I did manage to create a Parody Music Video that used the Miis from a number of games and also from Miitomo itself. At the time, the Wii U was at the end of it’s life and I wanted to pay homage to the good times I had with its great games. I even used Miitomo to get the dancing Mii animations as well. When Nintendo announced the termination of Nintendo, I did what any person would do that was not ready to let go, I started a petition on Change.org. It was not the most successful petition but I resepct everyone that actually gave a damn and signed the petition. They, like myself, all had their reasons to keep Miitomo going. Some found comfort and helped them cope with depression. Some found solace after Miiverse was taken down. Some people even found love and started new friendships. Miitomo was a lot more influential than a lot of people give it credit for. Unfortunately, we did not succeed in building up enough influence that would make Nintendo think twice about terminating Miitomo. Perhaps the biggest failure of all was the lack of interest from other media sites. They would much rather repost some an article about 10 games they want to see come to Switch, or the latest media sales in a region as opposed to help a small petition get noticed. While we all knew that petition to save a failing mobile app was futile, it allowed us to show that we at least cared for the app and will be disheartened to see it go. 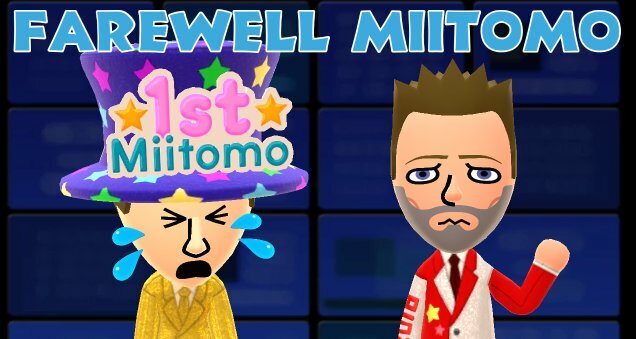 All good things come to an end and much like the Wii U, Miitomo will still be appreciated by a priveliged few that had the opportunity to enjoy it for what is was, despite its flaws. When Miitomo first released, Miketendo64 was still a relatively young site, and I would lean on Miitomo like a crutch so with Miitomo now ended I will have to rely on my stockpile of Mii pngs for future feature articles. I would like to thank you all for reading this feature article and sticking with it til the end. To finish off, I shall leave you with just some of the many Miifotos, I have created with Miitomo. Most are silly, some are enjoyable but they were are made in jest with no intentions to offend. Farewell Miitomo. To some you were just a mobile app, but to me, you were the app that built Miketendo64!